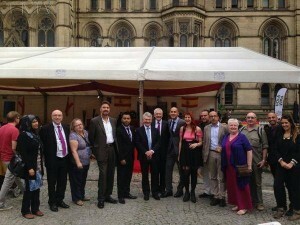 On the 4th , 5th and 6th September took place the Spanish Festival “Festejar” in Albert’s Square in Manchester which was organised by the company “T3 Events Ltd” and headed by Patrick Marmion, a perfect MC for an event with plenty of “duende” as we say in Spain. The event started on Friday morning and the Honorary Consul of Spain in Manchester, Antonio Guillen assisted to the event accompanied by his wife, Carmen; his assistant, Patricia Roldán, as well as some representatives of the Council, El Northern and the “Instituto Cervantes”. We enjoyed the Spanish food and music with singers like Alister Bilbao, Chic Pere and the singer Cadiz-born now living in Barcelona “IZA” who sung and recited some of her interesting flamenco-chill out songs. The figures confirm that on Friday about 4.000 people assisted to the event. That number increased on Saturday with about 5.000 people who attended the festival to see a Flamenco Demo by the dancers from Instituto Cervantes, and some other leisure activities like the Spanish singer Pol 3.14 and dancing with the rhythm of the DJ Alonso. The honorary Consul of Spain in Liverpool, Enrique Sanchez, also came to the Festival on Saturday to spend the day with his family, friends and acquaintances. On Sunday, for those who still had energy, there were Spanish salsa lessons and latin, jazz, funk and Reggae music. It is estimated that 3,500 people attended on that day. Not bad considering that it was Sunday and that it was sunny outside!. Thanks to companies as La Viña, La Tasca, The Molly House, Churtopia, Spanish Cupboard Deli we had the opportunity to enjoy the Spanish gastronomy with typyical dishes such as paella, churros con chocolate and tapas. Due to the success of the event, we would not be surprised to see that the event is hold again next year and who knows, perhaps other cities like Liverpool or Birmingham will also give it ago!